“Some of this is true and some of it is not” Natasha Greenblatt says to openTwo Birds One Stone, which premiered as part of the Why Not Theatre’s Riser Project, Thursday night. But co-star and creator Rimah Jabr, disagrees. It’s all true, she tells us. What unfolds is an aptly named fictional documentary of two friends— a Palestinian Muslim and a Canadian Jew— and their shared history. 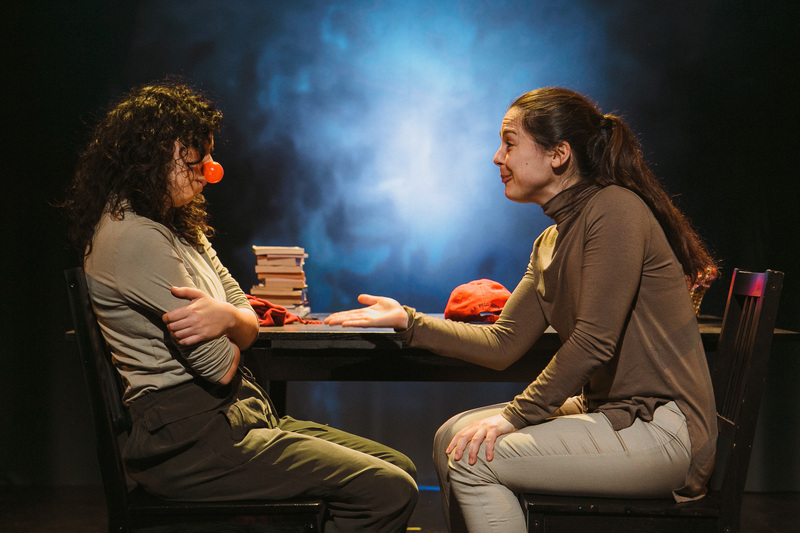 An intimate show, sitting comfortably at the intersection of theatre and storytelling, Two Birds One Stone is a complex, and elegant telling not only of two young women exploring their histories, but of Israel/Palestine politics. Two Birds One Stone, tells the story of Greenblatt, a Canadian Jew on Birthright, and Rimah Jabr, a Muslim Palestinian in acting school in Brussles, on their own individual searches for ancestry, meaning, and self. As their stories unfold across one another, they both embark on a search for the home of their grandparents, in the city of Netanya, north of Tel Aviv. The strength of the performance was in the echoes from one story to the next and their chemistry as performers. Greenblatt’s journey is intensely personal. Eager, earnest and naïve, she is looking for herself, looking to get out of Toronto, and looking for her great grandfather’s house in Israel. This searching is an effort to both understand and escape family trauma back home. Jabr offers a beautiful contrast to Greenblatt’s endearing energy. Unapologetic, blunt and opinionated, she delivers a deadpan that had the audience in both stitches and tears through the course of the show. Having grown up in Israel, her stories of struggle and abuse are told conversationally, and without much fuss: this trauma was all too common for her and those around her. What results is a deeply complicated weaving of these two divergent experiences within the Israel/Palestine conflict. It is both personal and political, lived and experienced. Their at time relatable, at time otherworldly stories of struggle speak to shared experiences of searching for home, and understanding loss and trauma. These two powerful writers and performers have given us a dance— jumping from one experience to the next, reminding us, again and again how complicated it can be to find home, self and family. The only downfall of the play was perhaps in the number of stories and threads they explored; I was not sold on all the comparisons the play explored. At one point— perhaps with the goal of making these issues more present for a Canadian audience— they make a connection between the Israel/Palestine conflict and the Canadian colonization of First Nation’s land. This made my academic eye twitch slightly, and had me asking what story they were trying to tell. Further, their use of projection, while beautiful, was distracting to me. In a play so story driven (and with Peter Brook’s Empty Space as of the props!) I did not understand their choice to animate the space with projection and multiple lighting cues. However, this criticism is overshadowed by the powerful core story, and their easy, energetic, and elegant telling. As Greenblatt reminds us throughout the play: “it’s complicated”. Indeed Two Birds One Stone tackles a complicated political moment with grace, intelligence and without oversimplifying or falling into cliche. Both unapolegetic and earnest, this two hander ends with the pair sharing a jaffa orange. Representing israli-palestinian collaboration, peace, as well as the marginalized (when on the sader plate), the orange becomes a brilliant metaphor for the many histories, stories, and selves they weave together throughout the show. As they share the orange with each other and the audience, Two Birds One Stone becomes an offering. One that asks simply what stories we hold, what battles we fight. Intensely relatable, wryly funny, endearing, thoughtful, and heart wrenching,Two Birds One Stone is an offering not to pass up. 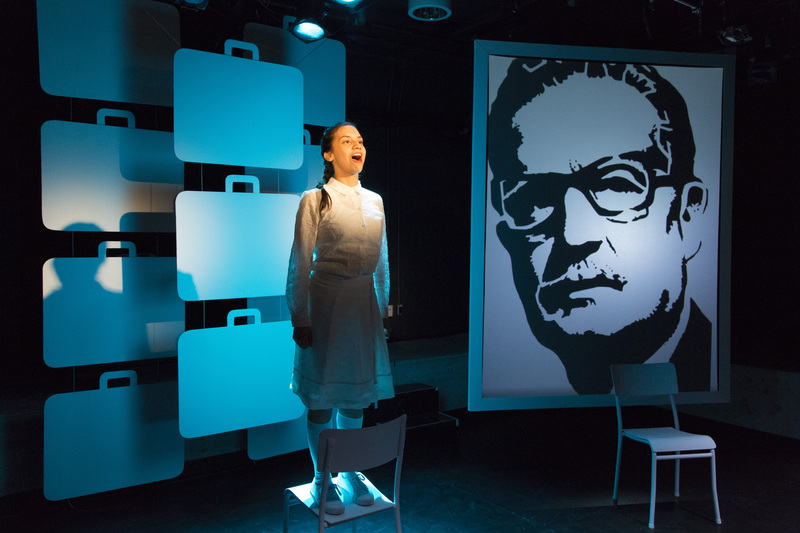 The inspired by the compelling true story of playwright Marilo Nuñez’s childhood, El Retorno/ I Return is another incredible show with Why Not Theatre’s Riser Project. A mix of lyrical monologues, evocative movement pieces, and traditional theatre, El Retorno/ I Return is a well-written and evocative play. Certainly, Nuñez is an accomplished playwright and El Retorno/ I Return another excellent show with The Riser Project. When she was six, playwright and director Nuñez moved from Toronto to Europe with mother, father, and sister. Exiles from Chile, the Nuñez famiy—like Fuenzalida family in El Retorno—spent the year training to be revolutionaries in preparation for The Return Plan, “an international effort to topple the Pinochet dictatorship” (program). Inspired by these events, the plays follows the happenings of a year just like this, from the perspective of the eldest daughter, Marisol Fuenzalida (Ximena Huizi). Through movement, poetic monologues, and traditional dialogue, El Retorno/ I Return weaves traumatic family struggles together with the innocence of children playing house. This pendulum swing from childhood innocence and play, to the realities of the Chilean dictatorship and the trauma of exile is incredibly evocative. What is it to be the child of refugees, the play asks. This question, and how it unfolds, is brilliant and endlessly engaging. This is enhanced by strong performances all around. Ximena Huizi, Sofia Rodriguez, and Augusto Bitter, playing the children, were particularly good. They all brought an lighthearted energy to their parts—a necessary playfulness in an intense show. And they demonstrated real range: at once playing exuberantly as children, then marching as soldiers, and next slowing their movement with precision during the movement scenes. Ximena Huizi, as Marisol, and Anita La Selva, as Verionica (her mother), brought their poetic monologues to life with depth and honesty, Huizi’s climatic monologue being particularly moving. And the projection throughout the show was yet another highlight. Beautiful shadow-puppet-style projections acted as backdrop during the traditional theatre scene, as well as illustrations of Chilean history during the three major movement sections, titled “Conquest,” “Imperialism,” and “Coup D’état.” These projected scenes were simple, evocative, and beautiful. Hats off to projection and set designer Peter Riddihough. These affirmations aside, the play occasionally felt slow. Perhaps it was the quiet scene of the family sleeping, against the performers’ tendency to yell during emotional moments, but the pacing of the performance felt off slightly. Or maybe it was the movement scenes, which, while well executed, also felt long. Choreographic choices to have the actors miming being shot in slow motion, or posing with revolutionary fist in air, felt at odds with the unique, honest and engaging story. While not always hitting the nail on the head in terms of pacing and energy, the performance, design and voice of the show were very strong. I was not always sold on how they delivered aspects of their story, but I never lost interest in the story itself. El Retorno/ I Return speaks evocatively to how common place trauma is for children of exile. But it also speaks to why we return to something called home, asking gently what drives us to return. These kinds of stories are what should be populating Toronto stages; it not only speaks to experience of Latin Canadians, but also to the many bodies worldwide still seeking refuge.